Last month’s Fells Point party was filled with friends, food, liquor and a large mural that repeated Stephanie Rawlings-Blake’s name and initials over and over in purple script. 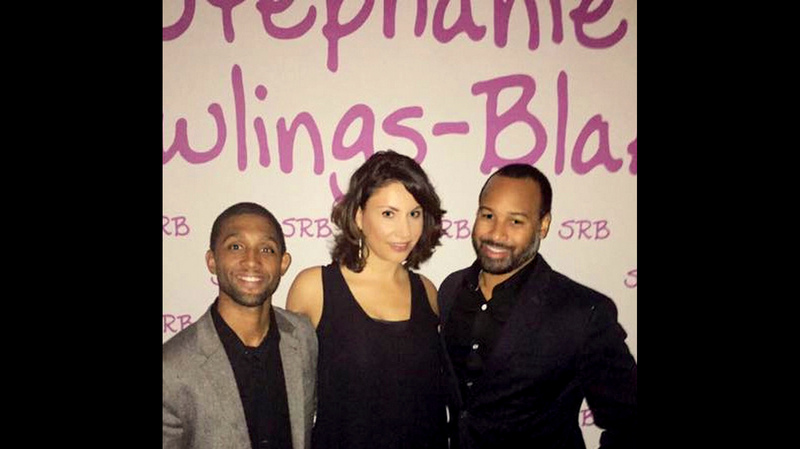 “Celebrating SRB” was how her chief of staff, Kaliope Parthemos, described the event on her Facebook page. The mayor’s campaign report to the Maryland Board of Elections painted a different picture. This was not the first time the mayor has used campaign funds for gifts, parties, meals and other networking opportunities since announcing, 15 months ago, that she would not seek re-election as Baltimore’s mayor. Many of the more than $150,000 in expenses she has charged to her campaign are not commonly deducted by other politicians, including her predecessor as mayor, Sheila Dixon, and her successor as mayor, Catherine E. Pugh. Maryland incumbents who do not run for re-election – or who lose the election – typically transfer their campaign funds to other political committees or give them to charities and other non-profits. Rawlings-Blake did transfer $13,000 to other committees before this year’s primary election, but did not make any charitable donations. 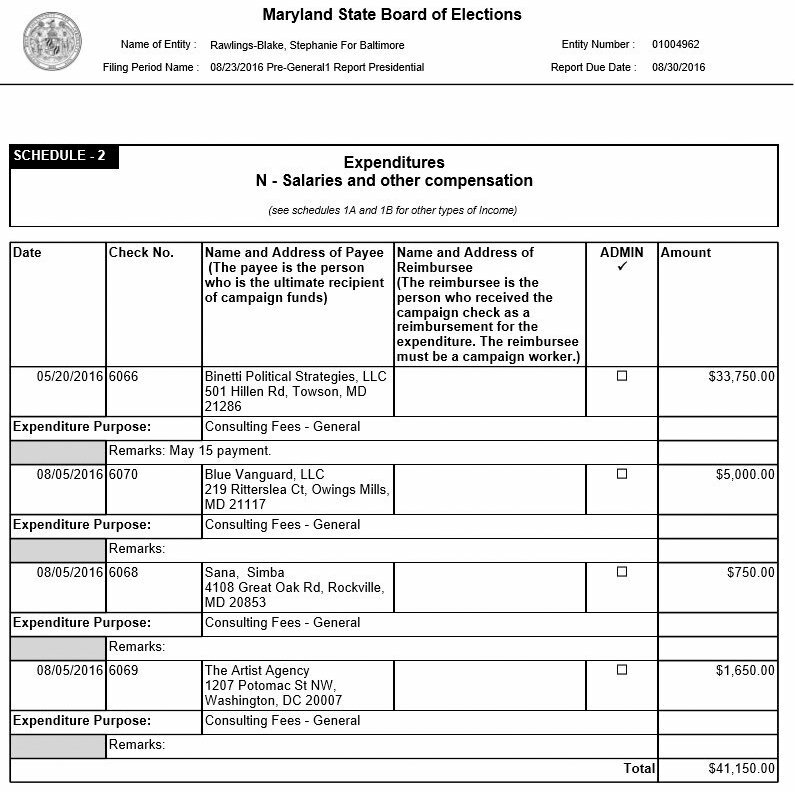 What makes her expenditures problematic, says Jennifer Bevan-Dangel, executive director of the watchdog group, Common Cause Maryland, is that Rawlings-Blake is charging money as campaign costs even though she is not running for office. “There are lot of blurry lines in election law, but the litmus test is pretty simple: Campaign funds should only be spent in furtherance of the campaign,” Bevan-Dangel said. For example, catering for the party at Bar Vasquez could be justified as a campaign event if Rawlings-Blake was running for re-election. 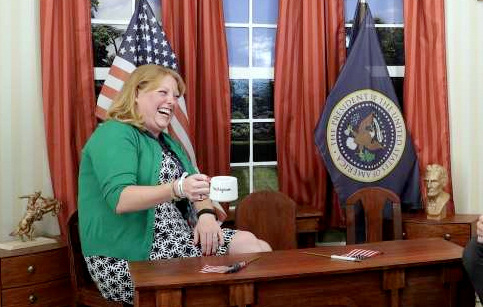 “But – and this is key – once you have announced that you’re not running, you just don’t get to use campaign funds for quasi-political or quasi-legislative purposes,” Bevan-Dangel said. A state election guide advises active campaigns not to allocate funds “for personal use or for expenses related to holding office,” Bevan-Danigel added. Rawlings-Blake’s term will end tomorrow, and she is not making plans to run for elected office, although she has said she will leave her future options open. The Brew submitted detailed questions last week about the campaign expenditures reported in this article to the mayor, her campaign treasurer Charles G. Tildon III, and Stephanie Binetti and David Kosak, co-owners of Binetti Political Strategies. So far, none of the parties has responded. The mayor’s reports, on file with the State of Maryland, can be viewed here by looking under “Stephanie Rawlings-Blake For Baltimore” in the Committee Name box. 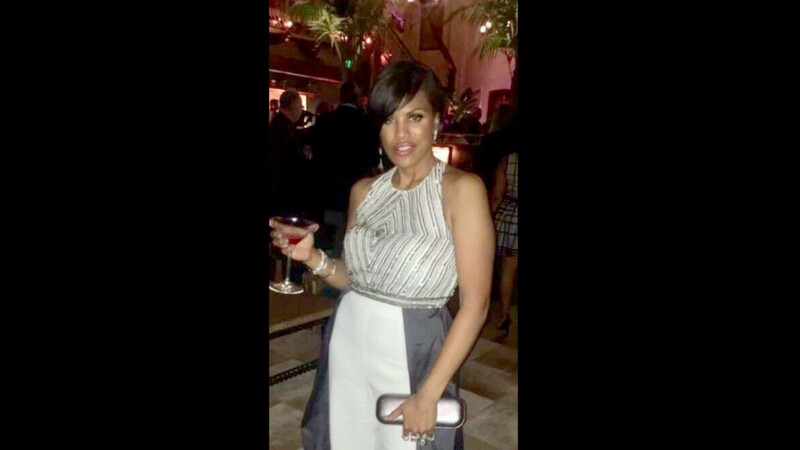 Campaign reports show that, since she took herself out of the mayoral race, her political committee, Stephanie Rawlings-Blake For Baltimore, has shrunk from roughly $425,000 on October 1, 2015 to $272,311 in her last campaign report on November 22. • $59,250 to her former political fundraiser, Binetti Political Strategies. Even though Binetti has not raised any cash for the mayor since September 2015, the company has since received multiple payments for “consulting fees,” including a $33,750 check issued on May 20, 2106. • Binetti was paid $342 to buy gifts, including liquor, for a leadership meeting of the United States Conference of Mayors in October 2016 (when Rawlings-Blake served as its president) and $2,620 for hotel rooms, gifts and transportation for “staff” accompanying the mayor to the Democratic National Convention last July. 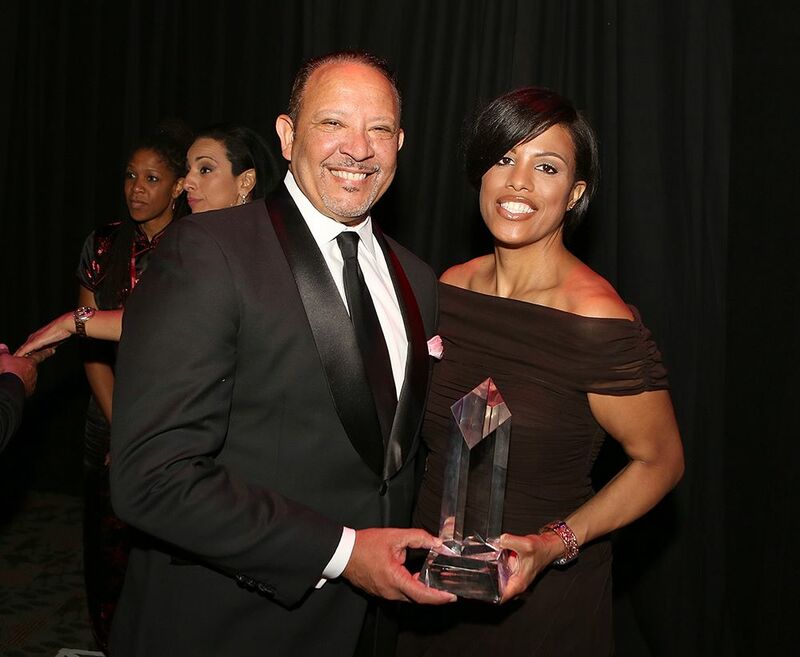 • $6,650 was paid by the mayor’s committee to a modeling agency and video company last August on the same day that Rawlings-Blake received the Whitney M. Young Jr. award at a downtown gala sponsored by the National Urban League. • $4,808 was paid to the Baltimore Ravens last April for skybox space at M&T Bank Stadium. An additional $2,508 was spent by the committee for food and beverages at Ravens football games (listed as “meeting expenses”) since mid-September 2015. • $1,357 for the mayor’s hair, makeup and professional photography. • $1,381 for hotel rooms for her campaign treasurer, Charles G. Tildon III, at the Democratic National Convention. • $3,236 for the mailing of the mayor’s holiday card last December. • $408 for meals paid to Parthemos, Tildon and Rawlings-Blake’s younger brother, Wendell Rawlings, plus $71 to the mayor for a meal she had at Loews Miami Beach Hotel last March 28. The expenses that were deducted this year from the mayor’s campaign committee were three times greater than the $20,473 in expenses the mayor’s committee reported in its election board report for year 2014. During the presidential election cycle, the 46-year-old lawyer served as secretary of the Democratic National Committee, gaveled in the Democratic National Convention last July, appeared as a pro-Hillary Clinton commentator on cable network shows and was an unpaid analyst for ABC News on election night. Recently, she joined the roster of WME-IMF Speakers, a Manhattan speakers bureau that bills itself as the global leader in entertainment, sports and media celebrity talent. Rawlings-Blake is now offering her services to speak on such topics as women in leadership, crisis management, social justice and fiscal management.